Welcome to the Heardmont Nursery! We’ve made progress by leaps and bounds in the nursery over the past week. 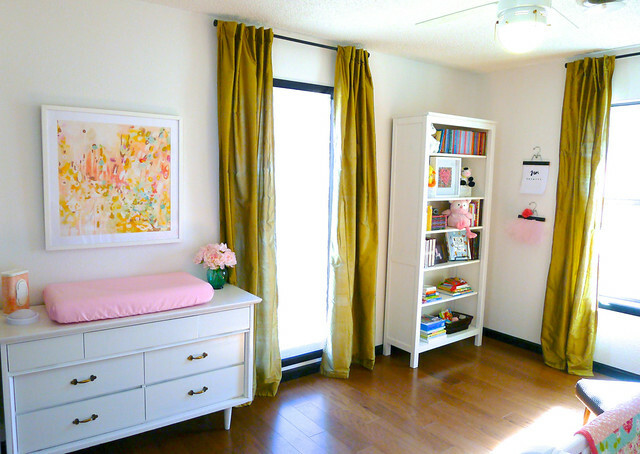 Minus a fluffy area rug and a few items for baby’s safety, I’m calling this room done! Here’s a mood board I put together for inspiration. Ready to see how close we got? 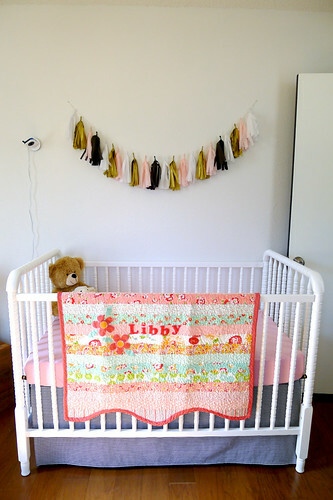 Welcome to Libby’s room! 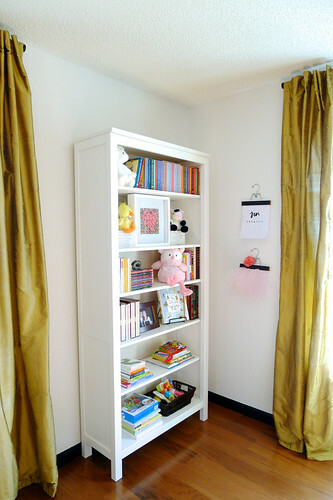 The Michelle Armas art above the dresser inspired the color scheme. 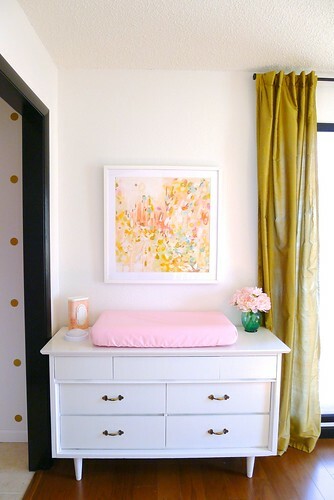 I’ve been sewing up a storm over the past few days, and that pink changing pad cover was one of my recent successes (easy tutorial here). 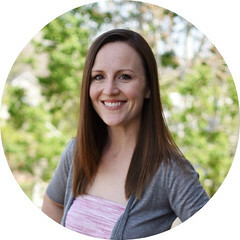 We shared a peek at the gold polka dots I added to the closet last week. Now here’s the nook all loaded up with tiny baby clothes and lots o’ baby gear. I can’t. handle. the cuteness. We swiped the bookcase from our set in the living room, and it fits my childhood book collection plus our new baby books perfectly. Lots of the books on this shelf were mine growing up. 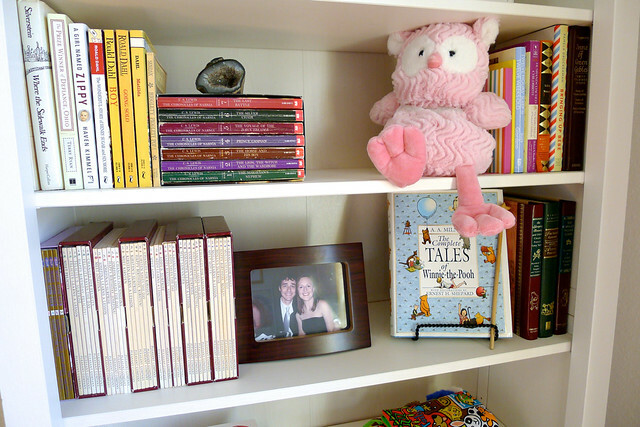 The Chronicles of Narnia and my American Girls books have found a new home! Side note: how young do we look in that photo? That picture has sat on Stephen’s desk at every single job he’s had, starting with his college internship, and now it’s found a new home in our baby’s room! The heart art Stephen made me for our first anniversary found a new home on this shelf. 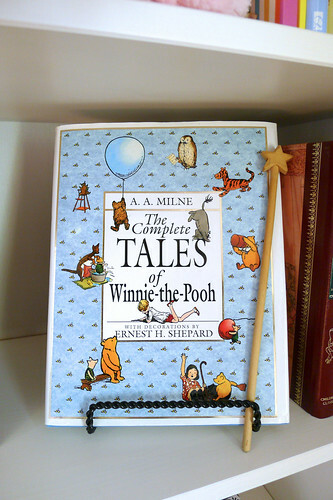 Here’s another one of my childhood favorites – The Complete Tales of Winnie the Pooh – plus a little wooden wand my dad made for me about 27 years ago. 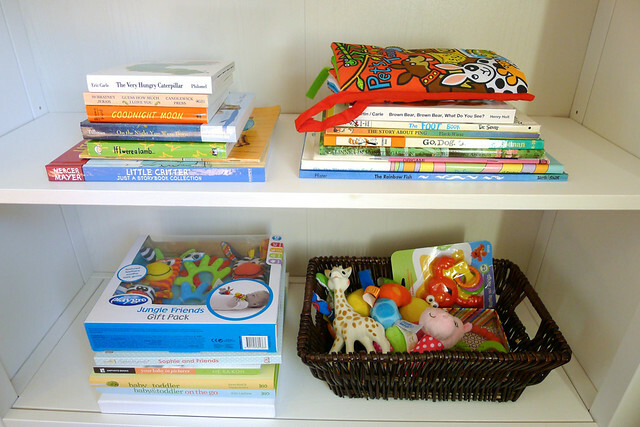 The bottom two shelves are where we keep the board books and toys. I’m sure the toy collection will eventually take over these shelves, but for now it’s confined to one little basket. On the other side of the room is our new Jenny Lind crib, ready for our little girl. 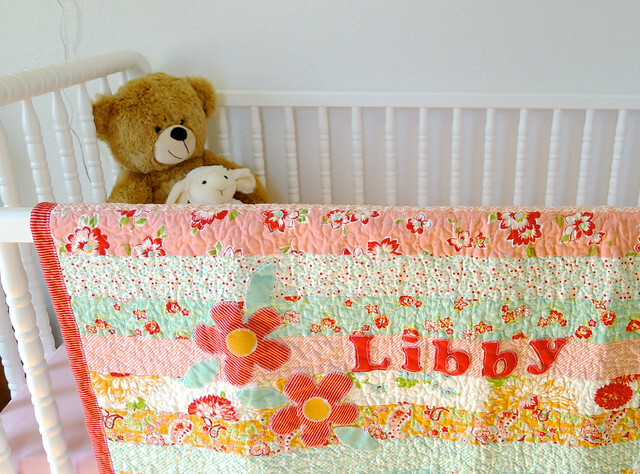 The beautiful quilt was handmade by the mom of one of our closest friends, and we love it! 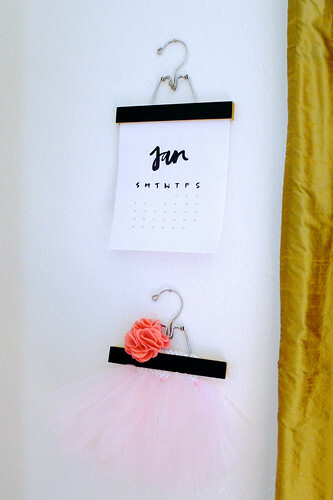 I made the tissue paper tassels using this tutorial. You might have noticed I switched out the mint tassels from the last post in favor of a few black ones (I like the drama!). A cord cover for our night-vision baby monitor is one of those baby safety items still on our list. 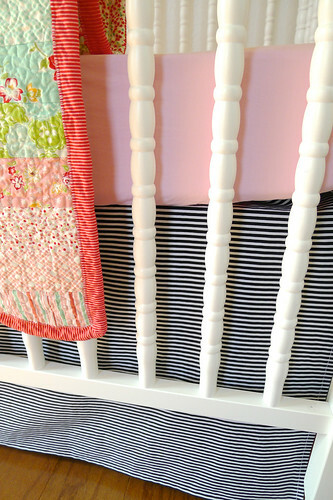 The black and white crib skirt was another DIY sewing project I tackled this week. I followed this tutorial, and it couldn’t have been easier. Plus, it’s adjustable for when we lower the crib mattress down the road. 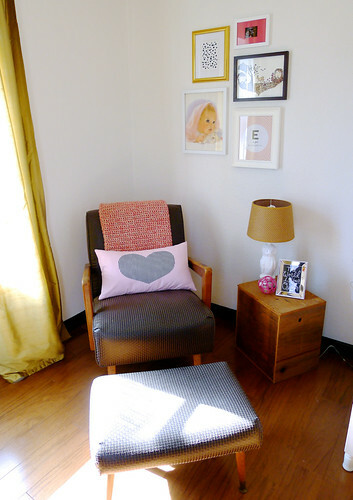 Our little reading corner is missing one art piece we plan to hang on the wall above the chair, but I love it so far. 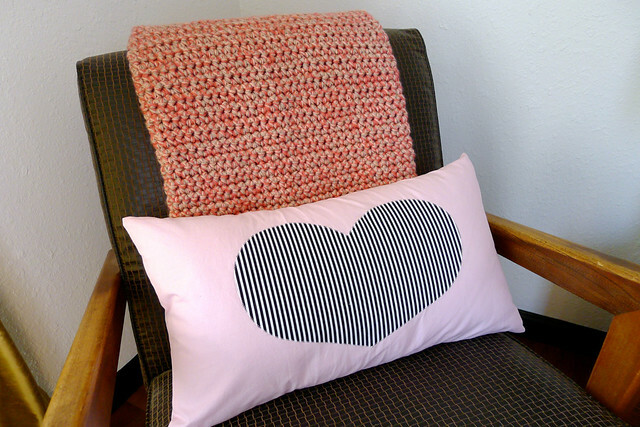 I sewed a cover for the lumbar pillow using the leftover changing pad and crib skirt fabric. 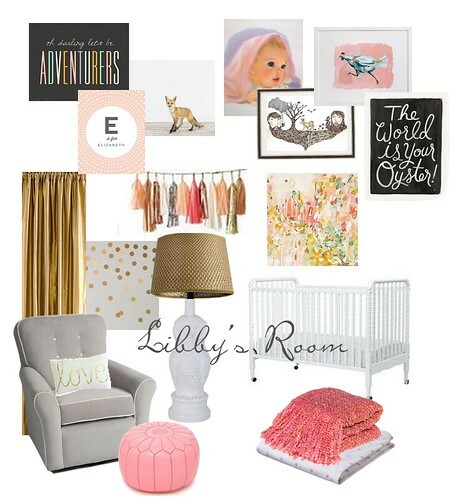 A February baby won’t mind a few hearts in her room, right? The blanket over the back of the chair was a true labor of love. I started crocheting that bad boy in December and worked on it for several days over Christmas vacation. It was supposed to be much smaller (following this tutorial), but I was overzealous and ended up with a 5′ x 6′ blanket when I finally finished it Tuesday night. 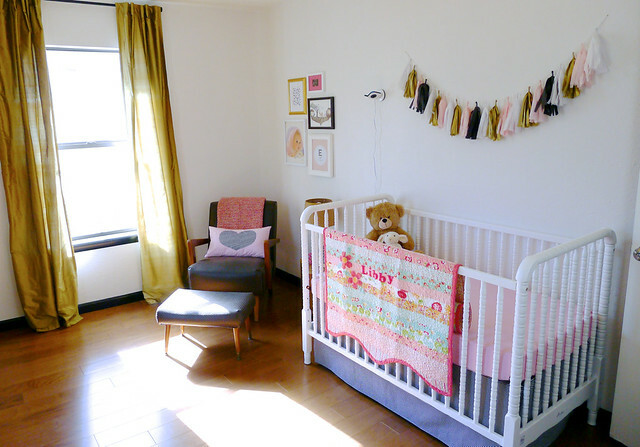 I’m glad it’s big though, because now the parents get a cozy adult-sized blanket in the nursery too! 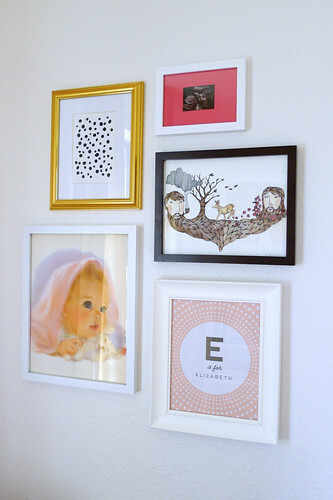 Our little gallery wall is a mix of old, new and DIY art. I painted the black spot art (inspired by this post), the baby print is vintage, and the E art was a free printable. 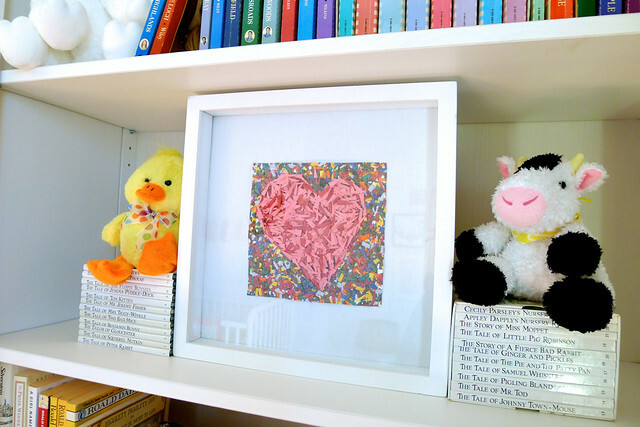 The tiny black piece with the pink mat is a cute ultrasound picture of our baby girl sucking her thumb, and the drawing by The Little Canoe was an Etsy find called Bearded Man and Woman. We’re still on the lookout for a nice fluffy area rug to warm up those wood floors, and I’m planning on picking up a cord cover for the baby monitor and a few other baby safety items this week, but other than that, this room’s done! 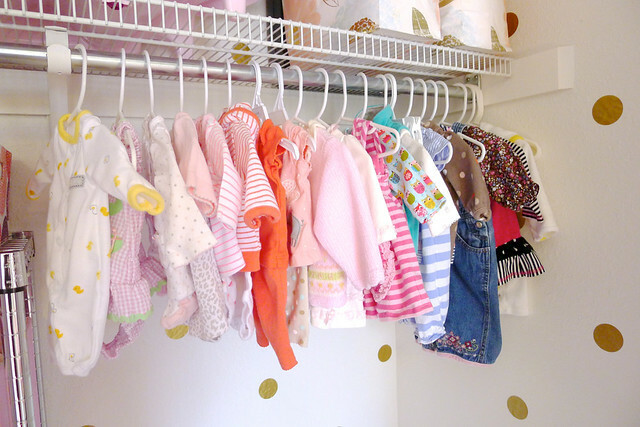 Time to pack the hospital bag – T-minus four weeks until our little girl arrives! 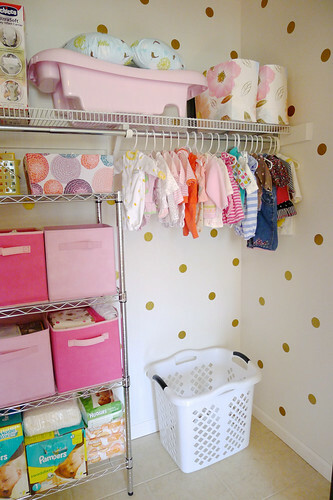 This entry was posted in Babies, Before and After, nursery and tagged gold polka dots, Michelle Armas, pink nursery, white nursery. Bookmark the permalink.